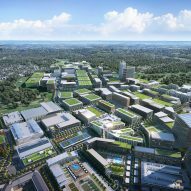 Architecture firms Elkus Manfredi and Sasaki have unveiled a masterplan to transform a parcel of land south of Boston into a smart city, the latest in a string to be announced for North America. 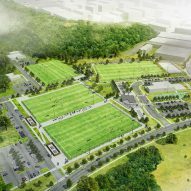 Boston-based Elkus Manfredi Architects and Sasaki Associates have masterplanned an entire new city for a site located 12 miles south of Boston, near the towns of Weymouth, Rockland and Abington. Developer LStar Ventures acquired the site – approximately 1,500 acres (607 hectares) – two years ago, with the ambition to build a new community "from the ground up". The area operated as a United States Navy airfield from 1942 until 1997 – including a stint as a Navy blimp, or airship, base during the second world war. 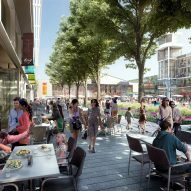 Named Union Point, the project follows a host of recently unveiled plans for smart cities in the US and Canada, including Alphabet's Sidewalk Labs plans for the Toronto waterfront and tech billionaire Bill Gates' investment in a huge patch of land in Arizona – both with intentions for futuristic urban areas. 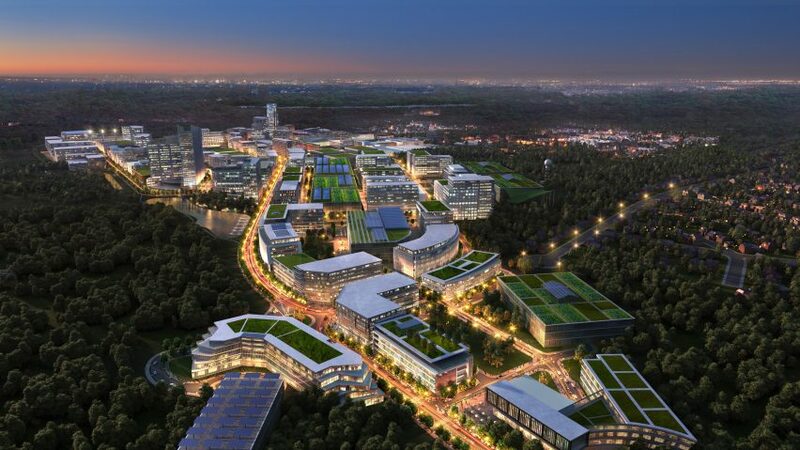 Like the others, the new Massachusetts city will incorporate high-tech features such as autonomous vehicles, and smart systems for collecting and sharing data, to improve the lifestyles of future residents and the management of the city. Elkus Manfredi and Sasaki Associates, who intend the project to pioneer the construction of future urban developments, have also focused on environmental and sustainable design aspects in their proposal. "Becoming a new paradigm for a smart, and connected cities, Union Point will support all facets of life in one destination that inspires innovation and integrates technology, living, and social systems with long-term environmental, economic and social sustainability," said the team. 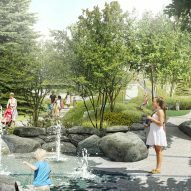 "The result will be a community that combines active living with 'smart city' design to offer the advantages of urban density in a supremely livable environment." Among key elements of the scheme will be an overhaul of transportation, including street design and parking structures adapted for autonomous vehicles. Comprehensive bicycle networks and electric driverless shuttles are intended to encourage a move away from private vehicles. Private garages are designed to be adaptable, for when private cars are no longer used. The masterplan also proposes connecting the shuttle system to the Massachusetts Bay Transportation Authority (MBTA). The built environment will also be integrated with the natural habitat. 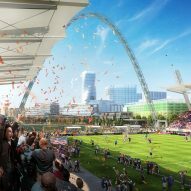 Structural developments will occupy a third of the site, leaving 1,000 acres (405 hectares) for green space and hiking trails. Residences will be topped with green roofs where possible, and environmentally friendly energy sources such as solar collectors and heat pumps will provide power. In total, the city will include 4,000 residential units and 3,000,000 square feet (278,709 square metres) for offices and "innovation" spaces, reportedly hoping to lure Amazon to build its new headquarters in the area. 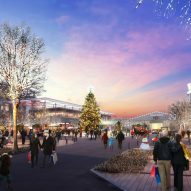 Commercial facilities such as restaurants and shops, as well as entertainment, arts and culture facilities and a sports complex, are also included. New builds will join retained structures on the existing site. For example, an existing aircraft hangar will be renovated as part of the project. The creation of new smart cities is happening alongside the integration of technology into established metropolises. Architect and television presenter Jason Pomeroy told Dezeen that the latter is proving to be more effective, with Barcelona and Amsterdam providing much better examples than places like Songdo, the new hi-tech satellite city in South Korea. Renderings are courtesy of Elkus Manfredi Architects.